Scutellaria resinosa Smoky Hills is a perennial well adapted to thrive in some of the harshest spots in our gardens. The Prarie Skullcap is a selection from the Smoky Hills part of Kansas. If this plant likes Kansas I don't think we can upset it with any part of our garden. Scutellaria resinosa Smoky Hills prefers a hot spot in full sun. Drought is fine with the Prarie Skullcap once established. Scutellaria resinosa Smoky Hills grows to about a foot tall and wide. Good drainage is important for the Prarie Skullcap. Scutellaria resinosa Smoky Hills has purple/blue flowers with a pair of white markings on the fall of each flower. Scutellaria resinosa Smoky Hills blooms from late Spring through Fall. Pretty sure our winters don't measure up to Kansas, Scutellaria resinosa Smoky Hills will be fine. 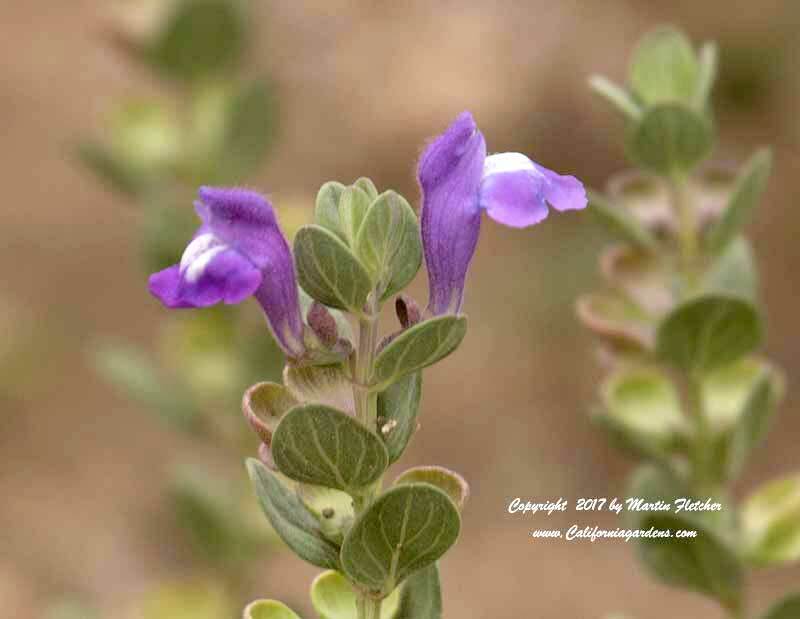 Purple Blue flowers and foliage of Scutellaria resinosa Smoky Hills the Prarie Skullcap. High resolution photos are part of our garden image collection.